Become a Member! Join us online or contact Membership at 212.621.6780 / 310.786.1066. William Shakespeare died on April 23, 1616. This 400th anniversary year is being celebrated around the world with theatrical presentations, screenings, seminars, museum exhibitions, and walking tours. 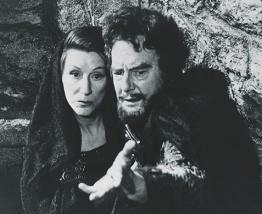 As part of the celebrations, The Paley Center for Media in New York and Los Angeles is offering a rare chance for the public to see six seminal Shakespeare telecasts—none of these programs are commercially available nor can they be found on YouTube. Stars including Richard Burton and Richard Chamberlain are joined by distinguished British and American actors in supporting roles, and all but one of the Hallmark Shakespeare offerings feature the renowned British actor Maurice Evans. Evans and Hallmark Hall of Fame executive producer and director George Schaefer meticulously cut each play for television (to fit the 90-minute to two-hour time slot allotted to Hallmark Hall of Fame) with a goal to keep each small screen adaptation “taut and swift” and infinitely enjoyable for audiences of all ages, many of whom were experiencing Shakespeare for the first time.